It’s common to have a New Year’s resolution related to your health, and that’s great. We should all strive to focus more on healthy living, but why stop at “eating right” and “exercising more”? This year consider including your body’s largest organ in your healthy New Year’s resolutions. That’s right, make a resolution for your skin! Resolution #1: I will wear sunscreen. Start the New Year right with one of the easiest things you can do to prevent skin cancer– wear sunscreen. With so many options out there, you’re sure to find a sunscreen solution that works for you. From chemical sunscreens to mineral sunscreens and even beauty products containing sunscreen, there are more ways to protect your skin from damaging UV rays than you can count. Our resource library is full of details on sunscreen, including how sunscreens work, our recommended sunscreens, tips for applying sunscreen, and dermatologist-approved SPF makeup brands. To implement this resolution, store your sunscreen along with all of your daily morning hygiene products. Apply sunscreen over any other skin care products, and remember that it takes about fifteen minutes for sunscreen to fully absorb into your skin. But if you really want to take care of your skin this year, don’t stop there. Resolution #2: I will moisturize. One of the most common misconceptions about routine skin care is that only certain types of skin need to be moisturized. If you have skin (and we all know you do), you should be moisturizing! The right type of moisturizer helps your skin stay smooth, clear and wrinkle-free. Skin that is too oily or too dry is prone to blemishes, like acne. Even acne-prone skin should be moisturized with an appropriate moisturizer free of parabens, added fragrance or mineral oil. Moisturized skin has a healthy, radiant look that helps mask skin complaints such as discoloration or blemishes, and hydrated skin has a firm, plump look that reduces the look of fine lines and wrinkles. Love your hot showers? They feel good, but unfortunately they strip your skin of its natural oils, leaving it dry and thirsty. This New Year, try out a few of our recommended moisturizers for face and body. Your skin will love you for it. Tanning beds are so deeply damaging that it is hard to find any evidence at all that supports their use– except, of course, that many people enjoy the tanned-skin look. Even using a tanning bed just once can do irreversible damage. In fact, people who use a tanning bed for the first time before age 35 raise their risk of deadly melanoma by 75 percent. The UV rays in tanning beds can also lead to premature aging, wrinkles and eye damage. What are your options? You have a few. While there is no such thing as a healthy suntan, it is possible to get the sun-kissed look you seek with a spray tan or self-tanning lotion or cream. It may also help to realize that tanning is a relatively recent fashion trend, and not all celebrities are going for the “gold” look. Nicole Kidman speaks out about her passion for sunscreen and shuns tanning. As dermatologists, we’d love to see more stars aligning in that direction. You know smoking is bad for your lungs and your overall health, but do you know what it does to your skin? If you have a heavy smoker in your life, you may have noticed how they appear to age more rapidly than other people you know who don’t smoke. There’s a reason for that. Smoking speeds up the normal aging process of the skin, leading to premature wrinkling. The nicotine in cigarettes causes narrowing of the blood vessels in the skin, impairing blood flow and reducing the skin’s access to vitamin A and other nutrients. The chemicals in tobacco smoke also cause damage to collagen and elastin– the proteins responsible for skin strength and elasticity. Lastly, the combination of heat from cigarettes and the actions associated with smoking (i.e. pursing the lips) also contribute to wrinkle formation. If you smoke, please consider making 2019 the year you ditch the habit. There are several effective ways to quit smoking. Whichever one you choose, your skin (and the rest of your body) will thank you for it. 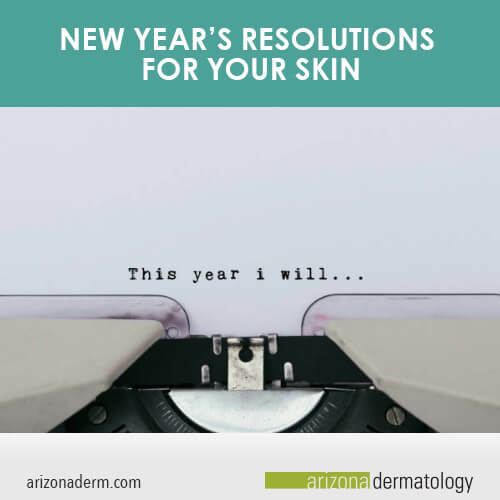 Whatever you decide to do for your skin this year, we at Arizona Dermatology are here to help you. Contact us or make an appointment. Happy New Year from the doctors and staff of Arizona Dermatology!